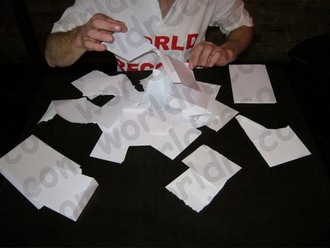 This is the story behind my Guinness World Record™ for the Most envelopes torn in half in 30 seconds. If you say I'm different, I'll laugh. If you say I belong in an asylum, I will probably listen. That's because you could be right! Of course it is not normal for a person to say such things about themselves, but the word 'normal' is very rarely applied to me. For example, when I got a chance to rip envelopes in half as fast as I could, my excitement levels soared. If I remember correctly, I didn't eat that night – I was too busy mulling over the intricacies of how to tear postal envelopes with great skill. This was so important to me, I was becoming devoted to it. A friendly postman passed over a block of surplus envelopes to me. I was ecstatic; he was relieved to get rid of them. Clutching the precious things, I speed-walked home and opened the pack all over the sofa. Kneeling down with glee, I made two piles: one from which to pick each envelope as I needed it, and the other as spares. I knew it was going to be tricky to operate the stopwatch as well as tear paper and record the results accurately. So I tried it to get an idea of what I'd need to do. My first practice went reasonably well; surprisingly, I managed. Torn paper lay strewn over the couch, the floor and the cushions. I liked what I saw. Perhaps it was because I do so many unusual things that somehow I've developed a skill at doing the quirky. It might sound strange, but my pulse was beginning to race. All these lovely envelopes I'd acquired which I could rip, and the thought of being credited with a world record for it, were creating tremendous excitement for me. I know you understand how wonderful this feels, and I was desperate for more of the feeling. I jumped up and stretched. The bubbling excitement was almost too much for me to bear. My heart was pounding; if anyone had seen me, they'd have sworn I had just been for a run. Back onto my knees I fell, and reached for more of the envelopes. By nightfall, I was in a mood for ripping anything and everything. I'd become some kind of paper attacker! Sheet by sheet, I tore through my pile of scrap paper which I usually use as recycled worksheets. I was loving it. Once I'd decimated that, I turned to the recycling bin. Cardboard, food wrappers and unwanted correspondence were among the paper-based items I destroyed. This was giving me a great feeling of satisfaction. I could think of no better way to spend my evening. And, eventually, at the end of my private crusade, I felt weak and exhausted but satisfied and stress-free. The house resembled a bizarrely surreal northern winter: rectangular white pieces of paper all over. In amongst them were coloured bits of many shapes and sizes. The battle in my home had been won, my insatiable appetite for tearing paper had been almost satisfied, and I was ready for bed. When I awoke, by then rather more mentally grounded, I wasn't happy. There was a tremendous mess to clean. An hour later, I sat to consider my strategy. One thing was certain. I'd got a fair amount of practising done. So I could tick that off my list of preparations. But, deep inside me, the will to rip envelopes had not yet been extinguished. I was pleased, since I'd need that drive if I were to stand any chance of getting this world record title. The morning I'd been preparing for finally arrived. Having not forgotten the paper destruction ordeal, I strode into the venue with my helpers, grinning. If I could churn up the paper in my own home like that, I was sure to make light work of a pile of envelopes here, I told myself. On a small table, I laid out the spread of envelopes with care. To each, I paid careful attention, knowing it'd be useless in under an hour. I handed the stopwatch to one of my assistants and within minutes I was ready. It was wonderful. Each envelope I tore gave me a joyous sensation. Hearing the whisper-like tear and seeing the fluttering of the halves both delighted me. In quick succession, each brand new envelope was slashed. My rhythm was developing nicely when “Stop!”, the timekeeper announced. It had been that long already. I sat back. My hands were still alive with energy as if asking me for more envelopes to tear. But I'd done it, I thought. Looking down at the half-envelopes all around, I was confident I'd succeeded. I would need to wait for the judges' official decision; that I knew, but already I was pleased. Finishing this world record attempt was straightforward. I gathered the torn envelopes, replaced the little table and did a few minutes of admin with both my helpers. That was it. Another world record for my collection? I'd be finding out soon, and I loved the feeling.